In Gas Treatment on Monday October 24, 2016. Eltacon Engineering B.V. delivered two External Gas Fuel Units for the Jurong Cogeneration project in Singapore to be used upstream Gas Turbines. The Jurong refinery site from ExxonMobil will be expanded with a 84-megawatt cogeneration facility. 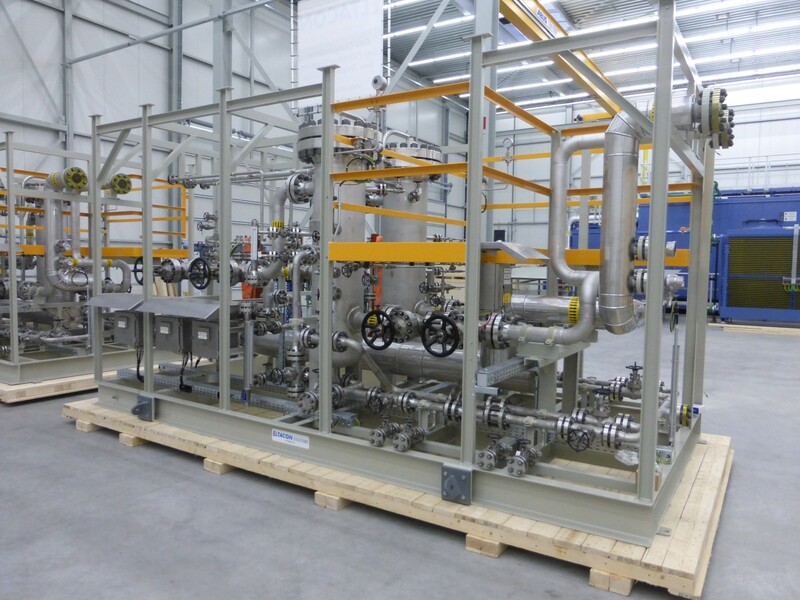 Eltacon provides the inlet fuel gas filtration and gas heating for two SGT-800 Gas Turbines, as well as an integrated unit installed in the turbine enclosure. The units ensure that the incoming natural gas is clean from liquids and particles and the gas quality is suitable for gas turbine operation. Each unit provides two streams, one in operation and one in stand-by for backup. ExxonMobil standards and approved products are used to ensure that the end customer’s quality requirements are met. The complete piping including drain and vent section has flanged connections and is made of stainless steel. This also applies for the gate valves, pressure and temperature transmitters and level indicators. Currently the units are being shipped as sea cargo to the port of Singapore and commissioning is planned in the beginning of 2017.